I met my dear friend Lynda for coffee in Gresham this morning. Drove over in the unexpected snow and actually, it is snowing again. Lynda is a long time friend who used to work for me and then had her own beautiful tea shoppe for awhile. We would go on buying trips together and we'd have the best time. She's a sweet Christian woman who has really been growing in her walk. We were attending the same bible study, but I quit as the drive was difficult from Troutdale to Beaverton at rush hour. I miss the study and have been feeling that my life has been out of whack. When we met today, she had a book for me and asked if I'd like to do a little study with her! She's already doing two other studies, so I feet quite special to be asked to do this with her. God is so good and so patient with me. I haven't been too sweet or caring this winter and to be honest, I need to be in His word more than I have been. So, I am encouraged and thankful for this dear one. We will meet once a month for coffee and a little lesson when she comes my way for her hair appts. A good plan.I must get to work now. I have a potato leek barley soup in the crockpot that is smelling so yummy. It's hard to quit watching the snow fall. Thank you God for such a calm and gentle day. Jim and I had a very special day with our daughter Angie yesterday. It was a belated birthday for Jimmy and a chance to spend time with Angie. What fun we had~a trip to the Goodwill bins and she found lots of goodies for her mid century mall space. It's fun to see what the young kids are buying and find interesting. It's always fun to dig! We hit a thrift store that she liked and then had dinner at Elmer's Pancake House! We were all hungry for breakfast and it was yummy. We relaxed during our meal and had a chance to just talk about things and it was good. It's wonderful to have adult children who can offer very good advise now. I was sharing a difficult situation with her and she helped me a great deal. Your children know you so well and I guess I forget that sometimes. I thank God for the beautiful daughters He has given me. I cherish them. Ang had some belated Valentine gifts for us. 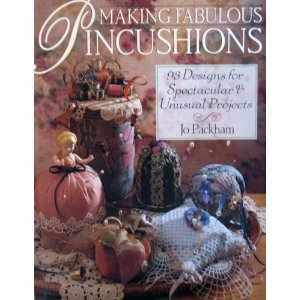 She gave me the most WONDERFUL pincushion book! I just love it....a treasure. The wind is picking up a bit and there is talk of snow again. I am not excited about snow now...I'm waiting and ready for spring. I remember the day I found the first internet Tasha Tudor group and I was so excited. I adored Tasha's children's books and art work and soon found many "friends" on the list. One thing lead to another and a new list was started~Take Peace~so I joined that one in 2006. In June of 2007 I traveled to Vermont to meet these ladies and attend a garden tour on Tasha's property. She was aging and still in her home, but too frail to meet visitors. It was unreal, but the very best part of it all was meeting these friends in person. I met up with LaVonne in the Chicago airport and that was the instant beginning of a wonderful friendship and a ton of laughs. Winter is hard on people. Before I knew it, LaVonne had booked a ticket to visit in February from Montana and then it was Kristen's turn from Massachusetts! The Tasha group does a Valentine exchange, so I thought it was the perfect time to have a Valentine's tea for my friends. Clarice and her daughters from Washington asked if they could crash our party, so the tea party was soon filled to the max! Jim decided he would get out of town to allow the girls lots of time and to just have a big slumber party. Our home is small and I only have one extra bed, so Kristen made up her bed on the floor by the woodstove each night. My husband is a sweetheart! How many guys would leave home, especially on their birthday??? I picked LaVonne up at the airport on Feb 9th and of course we had to have dinner at Tad's that night! Jim and her are crazy for chicken livers and I do believe they overdosed me. It was fun and I think they both got their fill. The next day we were off to the bins for some serious shopping. I knew it would probably be LaVonne's only chance this trip to find cheap goodies for home. It was pretty good. We picked Kristen up that evening and she was wound up like a top! Boy, she needed a break! Of course we stayed up late looking at her show and tell, talking about Annabelle, fabric and all such other doll matters! Friday took us down to Troutdale for a bit of shopping at the General Store and the antique mall. I think we frightened the clerk at the mall when LaVonne was talking about having to leave Annabelle's guns at home as she didn't think she could get them through security. LOL! 5:30 PM arrived all to soon and we had to be at Edgefiled, THE POOR FARM, for dinner. What a dinner....wow. The Black Rabbit offers wonderful gourmet meals with a local touch. Yummy. Of course, we had to split the dessert combo plate. Saturday morning brought a trip to my friend Bev and Roy's home for a tour of their dolls. I love going there any chance I get and it was magical to share it with my friends. Bev is a kick in the pants and Roy is so knowledgeable about paints and repairs...I know Kristen and him would have lots to talk about. Bev gave me another sweet Parian doll and I cried. She told me to stop blubbering. Crying would only give me chapped cheeks and I'd still have the same problem before I started crying. I was just so touched. After all of the excitement, we drove Kristen to Corvallis to spend the night with her mom and dad. Such a sweet little couple. It was easy to see where Kristen gets all her many talents~such a gifted family. Her family was so happy to see her. Jim came home for a night and took LaVonne and I to some estate sales on Sunday. We really had fun at one filled with sewing and crafting things. We were in that sale for an hour and a half...I've never been in a sale that long. Lots of fun stuff...some for resale, some for crafting, some for my retreats. We got back home, had show and tell and Jim was just leaving again when Kristen's parents returned her to us. I had some work to do for the tea party but those friends of mine kept trying to distract me after dinner. We are working on a Gathering for next year. We are hoping it will be in Iowa at Donna's tea place about a half hour from Des Monies. We are trying to find a mid point location this time. Pretty exciting and maybe a doll fair to go along with the fun. Oh, so much plotting and planning. I had to stay up until 2 AM to get things done for the tea. Valentine's Day arrived and there was a flurry of activity in this little house! I now have LaVonne and Kristen trained in the kitchen for making tiny tea sandwiches and such. They were so helpful, I would never have made it without their help. Clarice and her girls arrived around 2 PM and then the fun began. We had tea and goodies and exchanged Valentine treats. We were getting a bit loud when the doorbell rang-it was my friend Nancy! I invited her in and then she asked what was going on as she could hear us down the street! Oh my. Such fun. Clarice had to leave and the party came to an end. Once again, my house guest pitched in and helped me clean up. Then we opened our Valentine cards and gifts from our Tasha Tudor Valentine exchange. Such wonderful cards and goodies! A wonderful way to end the day and our visit. Kristen left Portland the next morning at 10:30 and LaVonne flew out later that afternoon. An empty house but my heart is still full of friendship and love. I'll be waiting here for another visit! My company took turns flying home on Tuesday and I'm trying to return to some kind of normal. Oh what fun we had! Kristen and LaVonne are very easy house guests and we just had a great time. It was nice to get to know Kristen better and of course, I adore having my BF friend LaVonne her with me! I need to download my pix and then I will write up our adventures~maybe later today when I've had more coffee. Still finishing the wash and need to put china and silver away from the Valentine's Tea. My head is still swimming in dollyland and planning for our next Tasha Tudor Kindred Spirits Gathering...dreaming, dreaming, dreaming. Time for company, time to think of Valentines! The cleaning is done, the fridge is full and the weather looks great for out of town visitors. Lots of fun things are planned but most of all, it's just wonderful to know that I'll be hanging out with some very special friends shortly. LaVonne arrives tomorrow and we're taking Jimmy to Tad's for chicken livers and beer! LaVonne and him are nuts about them...silly silly. I bake his favorite Lemon Jello cake tonight. Not a great culinary creation, but I've been making it for him for about 38 years. He just loves it. Our dear friend Evelyn baked it for him years ago. She's gone now, but we still have dear sweet memories of Ed and Evelyn. Kristen arrives Thursday evening and Friday is Dolly Day. I have been making WW dinners that are just great. It's been fun to try new recipes and they really are fantastic. I have about ten pounds off, so I'm encouraged. Jim brought me roses tonight~an early Valentine gift to share with my company. He's a sweetheart. Company is coming, so that means time to clean the house. Oh, things have gotten so dirty! The woodstove has been smoking away and with it comes so much dust. I have most of the work done now. I'll finish up the bathroom tomorrow and do some errands. Then it will be time for fun with friends....lots of fun! The new month has been here for days and I haven't posted anything! LaVonne and Kristen will be here for their Tasha Valentine's visit and break from their winter weather in less than a week! So much to do to prepare. My theme for this year of JOY is the Joy of Family and Friends which I think is perfect for February. Now I have to enjoy my preparations and my company and not get too caught up in the planning and cleaning. 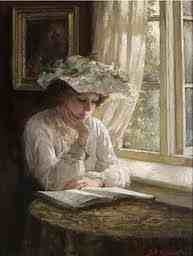 I mailed off all my Tasha Tudor Valentine exchange items on Monday and have begun to receive some here already. Thirteen ladies are participating this year and it is just so much fun. I will post pictures of my creations later as I don't want to give away the surprise. Yesterday was spent with dad. We had a nice afternoon chatting as I caught up his laundry. He is so pleasant. Jim came over and we had dinner together. Chicken pot pie...yummy. I am also planning out the Valentine tea for my friends. Clarice and her girls will be coming too. I am a bit nervous as Clarice is the most wonderful cook I know. I know she will enjoy my efforts and time spent with friends. I need to start collecting the tea cups, tea pots and all the tea party accessories that I will need for this pretty tea. The weather has improved and Duane will take out some very overgrown box woods today. We will be able to see our charming storage units! I prefer to call them my storage cottages. I finished hand quilting a small quilt that I had found at the bins. Oh my, hand quilting is hard. I would love to find someone to mentor me. I must work on that as it is such a desire to learn it well. Practice practice.